Not exactly a one-eyed giant. Classic Cyclops as he appears in the first issue of The X-Men! Syroco-style statue comes packaged in a tin box with character booklet. Numbered limited edition of 850 pieces. Not exactly a one-eyed giant from Greek mythology, Cyclops is still an "optic blast" mutant force to be reckoned with! 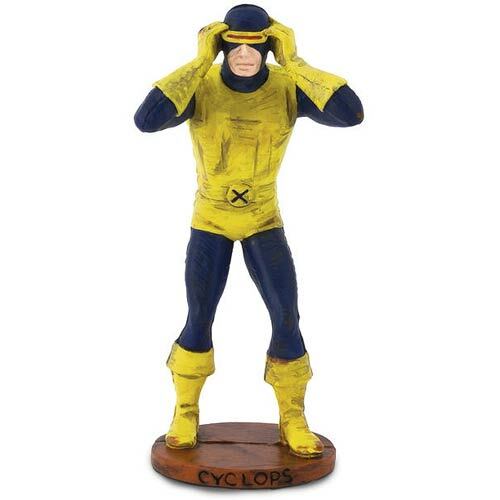 A numbered limited edition of 950 pieces, this X-Men Cyclops Uncanny X-Men #1 Statue finds Cyclops in Syroco style. The classic statue commemorates one of the most significant launches in comics history - The X-Men #1! The X-Men Cyclops Uncanny X-Men #1 Statue is the debut sculpture in the Marvel Classic Character line of statues from Dark Horse and comes packaged in its own tin box with a pin-back button and character booklet. It's awesome! DISCLAIMER: This is a brand new item and comes in a metal tin, it is not uncommon to see minor dings, bends or waves in the Tin due to nature of the item.